Some of your project pieces have beautiful details that are easily highlighted for a fantastic finish. Other pieces are very well made but not much detail. Why not create your own WOW! 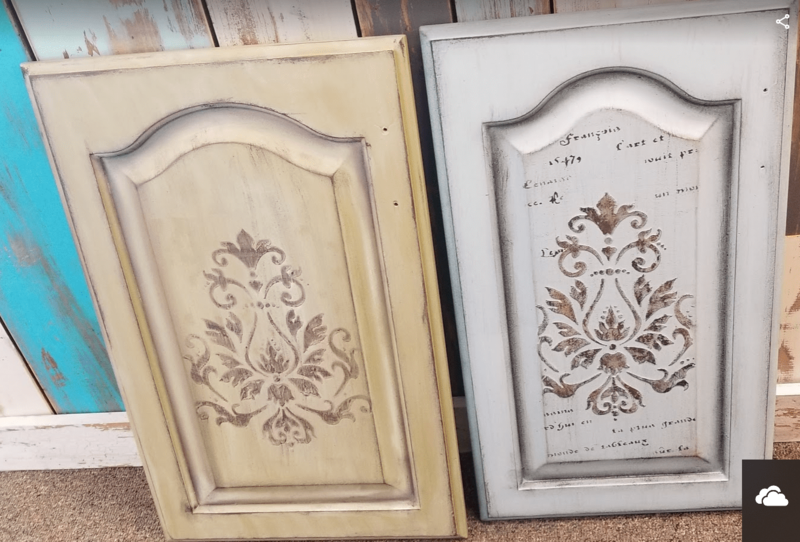 It is very easy to use a stencil with some Dixie Belle Mud to create a raised stencil. Dixie Belle Mud is very easy to apply with a mud knife and dries overnight. Mud takes paint well and sands much like plaster. All you need is your favorite stencil. You can use painter's tape to hold it in place. Apply a thin coat of Dixie Belle Mud to your piece thru your stencil using a putty knife. Scrape away the excess. The mud only needs to be as thick as your stencil (for a more aged look, only fill in part of the stencil). Allow your mud to sit for just a minute. Then carefully pull the stencil off by the diagonal corners. Allow to dry overnight, then apply your favorite finish. (If you notice stencil bleed from the stencil, wait for the mud to dry and scrape away with x-acto knife.) If you would like to see a video of creating a raised stencil, please click HERE. To see a video of a blended finish over a raised stencil, click HERE. If you want to be notified of new videos posted on youtube, please subscribe to my channel and click the bell icon.